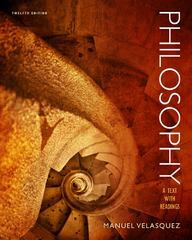 Philosophy 12 Edition Engaging and compelling on every page, Velasquez's text helps you explore and understand philosophy while it helps you appreciate the relevance of philosophy to your day-to-day life and the larger social world. This trusted text combines clear prose and primary source readings to take you on a meaningful exploration of a range of philosophical topics, such as human nature, reality, truth, ethics, the meaning of life, diversity, and social/political philosophy. Carefully crafted built-in learning aids help you quickly master the material and succeed in your course.